Well to be frank about it, I've had this clock sitting around my house for some time now. No one in the family really cares to much for it, I being the only one. I took the clock back to my place just out of respect for my grandmother. She really loved this clock (at least from what I remember as a child) She passed away when I was about seven so I really never knew to much about her, yet alone remember. Anyhow, I was up the other night watching a "Pawn star's" TV show out of pure boredom, saw a guy bring in a old clock and found out it was actually worth some money. 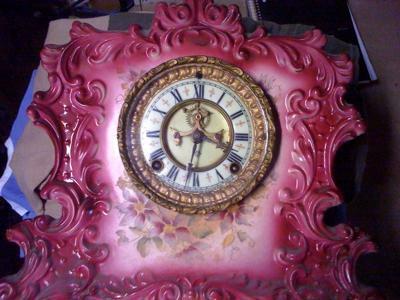 Never the less, I do not want to sell the clock, but would be curious on how much its worth. I would really just like some information for sentimental value, and any would be appreciated. As for what I know. Ill post some pictures on it: any feedback is great. Thanks anyone who looks or post info.